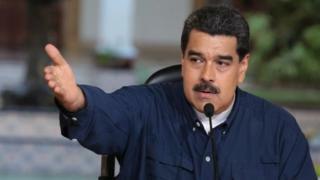 Image caption The US has branded President Maduro a "dictator"
Venezuela's President Nicolás Maduro has said that a preliminary analysis shows that new financial sanctions imposed by the United States will lead to a halt in oil exports to the US. President Trump's order bans trade in Venezuelan debt and blocks its state oil firm from selling bonds in the US. Mr Maduro went on national television to denounce the US sanctions as an illegal act of aggression. "Venezuela will never surrender to any imperial power," he said. Mr Trump's order, signed on Friday, will in effect force the closure of Citgo Petroleum, a US-based subsidiary of the Venezuelan state-owned oil company, PDVSA. The decision will cost the jobs of American citizens, said Mr Maduro, and affect the investments of US companies. "We will have no problem selling our oil to other markets," he added. Earlier, Venezuela's Foreign Minister Jorge Arreaza said the US was trying to promote a humanitarian crisis. Mr Arreaza also said his country was a victim of "fake news" that exaggerated its economic difficulties. The US accuses Mr Maduro's government of violating human rights and subverting democracy. Mr Arreaza said that the sanctions and "threats" amounted to "uncivilised politics". President Maduro would not attend the UN General Assembly in New York next month, he said. Announcing the new sanctions, the White House said the "Maduro dictatorship" was denying Venezuelans food and medicine. It said the controversial new constituent assembly - which has voted to take powers from the opposition-led parliament - amounted to a "fundamental break in Venezuela's legitimate constitutional order". Earlier this month, the US imposed sanctions on President Maduro and some of his closest aides. Separately on Friday, National Security Adviser HR McMaster said that the US was not planning military action in Venezuela "in the near future". President Trump had controversially raised that possibility two weeks ago. What did Venezuelans vote for and why was it so divisive? Video Venezuela crisis: What's going on?